Proclaim Liberty throughout all the Land unto all the Inhabitants Thereof. Words of Leviticus, Old Testament, inscribed on the bell. Today the Liberty Bell is an internationally recognized icon for freedom, but that has not always been so. 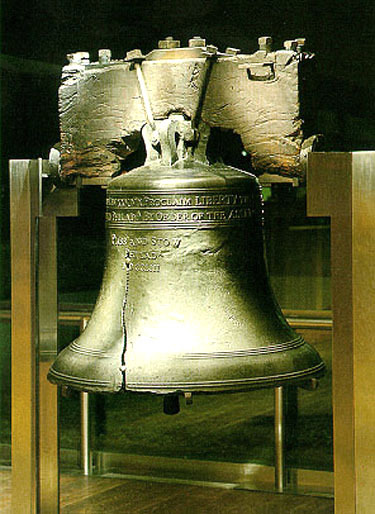 The bell was ordered for the Pennsylvania State House (today known as Independence Hall) in 1752, just after the 50th anniversary of William Penn's Charter of Privileges, Pennsylvania's liberal colonial constitution. Except for short periods, such as when it was hidden away during the Revolutionary War, the Bell spent its first 222 years in that famous building, ringing for routine meetings, special gatherings, and ceremonial occasions. Anti-slavery groups who adopted it as a symbol of their cause coined its name, The Liberty Bell, in the early 19th century. After the Civil War, the Bell traveled across the country, in an effort to reunite the nation. Since then, many groups have used it as a symbol of their struggles for liberty and equality. Today, even though it no longer rings, its message of liberty and freedom reaches people all over the world.